Hello friends! Better late than never right! 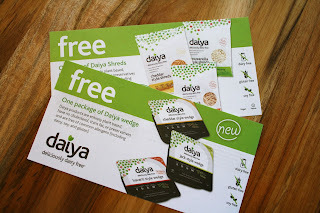 Sorry for the delay in announcing the winners for the Daiya coupons. Email me your addresses and I will get the vouchers to you immediately! sarena (at) thenondairyqueen (dot) com. So, in the midst of the craziness, my friend Lindsay brought something to my attention...#slowdownchallenge13. If you follow me on instagram, you've likely seen the hashtag. Jeff Goins has started The Slow Down Challenge for us all to stop, take a look around and really appreciate what is in front of us. After the craziness that has been this year, I really needed this. Life has been less than my idea of perfect in many areas and that tends to bring me down. Sure I have good times and good things going on, but you know, it's just not been my idea of great. I feel like we are constantly go go going and even in the quiet times, my brain is somewhere else. I don't want that anymore. I want the slow. I want to appreciate the moments here in front of me. I want to put everything down and really focus on my kids, my husband, my friends and my career. This is my new focus in life. I'm sorry that I'm not around blogging as much as I used to be. I hope to blog more once things settle down for me and I get into a groove again. I'm always on Instagram though. It's easier for me to pick up, post a quick pic and chat with everyone more one on one. I hope everyone has an incredible weekend! You know how I feel - slowing down, enjoying precious time with your family trumps blogging. Hugs friend. I apologized for being MIA today too. You know when all you want to do it take the weekend and catch up/take a mental break? I'm there. But I have wedding stuff all tomorrow. Argh. Good luck, friends! I DO miss your blogging, but thankfully I don't have to miss you! ...feeling lucky we are friends. So glad you're taking time to do the things that are IMPORTANT!!! Sarena- I so wish we could hang out. I'm planning on taking as much time as possible to be IN THE MOMENT with the family this weekend too. Hugs friend! Can't wait to hear more about your teaching!!!!! you know how much i love you?! TONS! and never apologize for doing what's best for you. That's why we love you and your big heart!